As I have written about on numerous occasions and will probably not tire of repeating anytime soon, I absolutely love my Treo. Just a little over a year ago I started this blog with the idea to discuss my ‘Treo Lifestyle’ experiences and connect with people who might similarly share an interest or even passion for their Treo and who wanted to engage and be engaged around this topic in ‘a journey of shared discovery’. These people, a community numbering over 1 million in the past year and averaging over 200,000 per month today, have since become known as ‘Treonauts’. This blog is dedicated to them. I knew relatively little about the PalmOS and even less about the Treo when I purchased one about a year and a half ago. I’ve learned a lot since but strangely feel that I still know so little – not a bad thing since this always reminds me that there is much yet to be explored, discovered and shared. Our journey has only just started. Having said this, while many of us continue to refine and enhance our experiences using the Treo day to day while on the go there are still millions of other people out there who have yet to share the bliss with us. Most Treonauts would naturally all like to change this and help to convert them – as we have typically done by, at least once, taking someone through a demo. In my case, this blog naturally forms the main platform through which I attempt to do this but someone recently asked me to develop “a clean URL to direct people to so that I can use your great info to convert them to the Treo experience!”. I’ve been thinking about different options to do this for a while and finally decided to set up this new URL at discover.treonauts.com where this post and maybe a couple of others in the future will be located. Please make sure to point anyone who might be considering to join the Treonauts family to this discover.treonauts.com URL in the future. UPDATE: To make it even easier to point your friends or colleagues to this page, I’ve now added a new domain www.DiscoverTreo.com which will automatically forward them here. So let’s get started, what is it that makes our Treo 650 the greatest and smartest of smartphones? Firstly you must know and understand that the Treo smartphone is a ‘convergence’ device which among others means that it combines in a single, all-in-one, package most of the features and functionalities which were previously only possible and available via multiple devices. The convenience of carrying and more importantly managing only one device is undeniable and the Treo 650 offers the perfect solution for this – some people have gone as far as being able to leave their laptops behind entirely when travelling. Thanks to a superb form factor that fits comfortably in your palm, offers an extremely intuitive and functional full mini QWERTY keyboard and operation/navigation buttons, weighs less than 180gms (6.3 oz. ), benefits from NVFS memory which allows your Treo to retain all data even if the battery powers down completely, a high resolution 320x320 touch-screen, a removable rechargeable battery, a high quality built-in digital camera and has up to 6 hours talk time and 300 hours standby time the Treo can be considered to be nothing less than perfect. 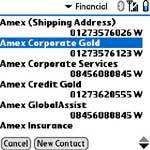 Above all the Treo is a superlative communications tool which allows you to quickly and easily access and dial any one of hundreds or thousands of contacts that you may have stored in the built-in Contacts PIM component and which you can synchronize with either the free Palm Desktop, Outlook on your PC (with PocketMirror) or Address Book and iCal on your Mac (see The Missing Sync). Naturally, calling someone these days is but one of many tools that we use to communicate with people and email has undeniably become absolutely critical. On this front, the Treo 650 comes built-in with palmOne’s Versamail which allows you to download and easily reply to your emails while on the go either from your POP3 account or Microsoft Exchange Server with Exchange ActiveSync for corporate email. Other third-party email solutions such as SnapperMail add IMAP and Chatter eMail offers Blackberry-like ‘push’ email functionality. Additionally, companies such as Good Technologies offer enterprise mobile email and applications solutions with GoodLink and GoodAccess. The Treo 650 also offers one of the most sophisticated built-in SMS solutions available with an excellent ‘chat-like’ filing system which allows you to keep track of and view multiple SMS messages filed as ‘conversations’ for each contact. People choosing an Unlocked Treo 650 or Sprint Treo 650 will benefit from Dial-Up Networking (DUN) which allows them to use their smartphone as a wireless modem via Bluetooth with their laptop. Verizon, Cingular and Earthlink Treonauts can also benefit from DUN via cable or Bluetooth thanks to PDANet. Finally, third-party solutions such as Verichat and Agile Messenger (free) offer Instant Messaging (IM) solutions for Yahoo!, ICQ, MSN & AOL chat networks. It’s obvious that most will also use their Treo 650 in order to optimize and/or complement their existing productivity applications. In this respect, all of the built-in PIM functionality of the Contacts, Calendar, Tasks and Memos will prove to be essential. As is often the case with applications available for the Treo, many third-party developers offer applications with even greater PIM functionality than the standard ones. Among others, in the case of PIM’s, Agendus, Beyond Contacts, DateBk5, KeySuite all offer unique enhancements. On a second level, the next most important consideration for the business professional will be to have a seamless ability to view and edit Microsoft Office documents while on the go. In this respect, the Treo 650 comes bundled with the standard version of Documents ToGo but you may want to get the full Premium Edition. Thereafter, application suites such as SplashWallet which includes a password manager, a personal finance manager, a photo viewer and manager as well as a shopping list application (all of them with an equivalent and convenient desktop application) may prove the perfect addition. Two other essential applications categories are outliners and databases. Here, respectively, ThoughtManager and HanDbase have been favourites for some time. You might also want to record any audio such as a voice memo, your kid, a concert or a meeting with a voice recorder such as Audacity DVR. On the one hand, the Treo 650 offers full web browsing capabilities to lookup any information that is available online with its built-in Blazer browser and an average data connectivity speed of 70 kilobits per second (depending on your network). Another faster but not free mobile browser for the Treo is Xiino. Additionally, websites such Google, mobile.answers.com, wapedia and Skweezer have developed mobile versions that are optimized to make it easier and faster for you to gain access to the information that you need directly from your Treo. 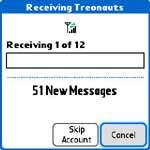 At the same time, individual Treonauts have taken the time to create their own ‘mobile portals’ of sorts such as A. Davis’ palm.nccomp.com and Treobits’ mobile.treobits.com. On the other hand, there are a ton of third-party applications that you can install on your Treo and synchronize with your PC for regular updates such as Vindigo for information about restaurants, movies, bars, shops and directions across all the major US cities and the rest of the world. Directory Assistant will dowload directory queries for free via YP.com and also provide you with driving directions. Handmark Express provides you with news, weather, sports, stocks, movie showtimes, 411 directory lookups, maps and directions automatically and on-demand. Flight Status provides you with free live flight status on nearly all of the world’s airlines. One of my favourite information apps, InfoMan has weather, phone book, movie times, box office, currency, stocks, jokes, gas prices, horoscopes and even dreams interpretation. iNoah and iPedia wirelessly download dictionary and Wikipedia data respectively. Lunar is an incredibly simple yet powerful, detailed and well designed tool to view the current, past and future phases of the Moon. QuickNews is a sophisticated RSS newsreader for your Treo with which you can read stories an a variety of subjects from your favourite blogs and websites. Stock Manager allows you to organize your stocks, retrieve quotes, and figure exchange rates. Applications such as WorldMate provides many of the must-have information you need while traveling – from world clocks and weather forecasts to comprehensive flight and travel information. Additionally, you might be tempted to keep reference material such as the Bible, Rand McNally Road Atlas and Oxford Dictionary & Thesaurus at hand with you at all times on an SD card. You might also be attracted by one of the many GPS solutions for the Treo 650 such as the Seidio G2500M to provide you with precise turn-by-turn directions when driving. Finally, there are all kinds of new SMS information services such as Google’s google.com/sms which are popping up all over the place and which allow you to query directories and perform searches via SMS. Overall, the industry has barely started to explore and develop all of the mobile information options that we’re likely to see in the coming years but the existing ones are certainly not a bad start. As I noted earlier, for most people their Treo 650 will be a business tool foremost but the fact is that for those long or short idle moments it can also become an absolutely terrific and extremely versatile entertainment device with all kinds of dedicated applications. For starters you can listen to mp3 music with the built-in Real Player. Armed with a 1GB or 2GB SD card and Pocket Tunes Deluxe (my preferred player by far) your music experience can be taken to the next level and you’ll also be able to wirelessly stream live Shoutcast Internet radio which works brilliantly! Watch .mpeg and .avi movies & videos currently on your PC and with no need to re-encode them using the free TCMP player – videos look absolutely fantastic on the high-resolution Treo 650 screen. Additionally, Kinoma and MMPlayer each offer some unique video playback features but do require re-encoding. You can also convert your DVD's to Divx for playback on your Treo using Pocket-DVD Studio. Streaming TV and other programs with services such as MobiTV and Orb Networks is not available for the Treo quite yet but both companies have declared their intention to make solutions for us sometime in the future. Snap pictures and shoot short videos using the camera and software built-in to the Treo 650 and even use it as a webcam with Palm Webcam. Even better now you can post your images within two clicks directly to a dedicated blog with SplashBlog and even view all your friends’ images as well. Others simply prefer to email the pictures directly to their favourite online photo sharing service such as Flickr. Carry with you and watch your entire photo collection and show it to family, friends, colleagues - the Treo becomes a 'photo viewer' with applications such as SplashPhoto and once resized I've managed to fit over 1,000 pictures in just under 32MB of file space. You can read ebooks of all sorts while on the move buying them from places such as Mobipocket or downloading them for free from Project Gutenberg. If you don’t like reading you can also listen to audio books from Audible. If you are motivated to read more things on your Treo (I'm starting to get the hang of it) then you can also check out what many praise as the best offline HTML and ebook reader called Plucker and its companion app Desktop Plucker. If you have your own blog then you’ll definitely want to have HBlogger installed on your Treo so that you can moblog (mobile blogging) while on the go. You can even use your Treo as a universal remote control with NoviiRemote Deluxe. And finally you can also play games of all kinds from traditional ones such as Tetris, board games such as Monopoly, Scrabble, Battleship & Yahtzee, backgammon and Mahjongg to an addictive arkanoid remake such as AnotherBall, the ever better Bejeweled2, Collapse!, Mazera and Cubis, card games such as BlackJack Deluxe and Solitaire, from the helicopter shooter Hellfire to word games such as WordPop! and TextTwist. Basically, as a mini 'computer' you can pretty much replicate all the functionalities of your PC on this little handheld device called Treo and with the ability to perform all of the above communications, productivity, information and multimedia tasks I hope that you’ll agree that the Treo 650 should unequivocally be considered the uber-convergence device. If you are considering getting your Treo 650 with a new (2 year) wireless service plan with either Sprint, Cingular or Verizon then you can order one via the Treonauts Shop. Alternatively, if you already have a wireless service plan you can purchase your new Unlocked or Sprint, Cingular or Verizon Treo 650 directly from palmOne. 2. 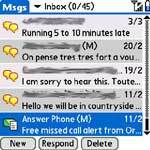 What other applications or scenarios make for your complete Treo 650 communications? 3. What other applications or scenarios make for your maximum Treo 650 productivity? 4. 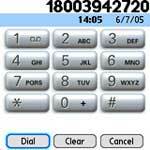 What other applications or scenarios make for your Treo 650 information immersion? 5. What other applications or scenarios make for your Treo 650 multimedia fun? Over time wherever I go whether it’s in town or when traveling I must have come across at least a couple of hundred Treonauts and at least that many if not more via email. While I didn’t get a chance to meet or talk to all of them individually the few dozen or so that I did get to speak to invariably have a ton of questions about how to enhance their Treo experience. They are most often particularly keen to know more about what ‘gear’ they should get after having purchased their Treo 650 and I will try to answer the what and why of this question below – something which proved surprisingly difficult to do. Screen Protectors ($15.95) are in my opinion one of the first and most important items to get and I personally stuck one to my Treo as soon as it came out of the box. Clearly a $15 item to help protect a $700 investment should be a complete no brainer. A Cleaning Cloth ($4.95) falls in the same category as the screen protectors and is a simple and cheap means to keep my Treo clean from face and finger oils which can periodically cover the screen and keyboard. I always have at least one of these or similar cloths in my pocket. Alongside the screen protectors, a Stereo Adapter ($5.95) was the very first accessory that I purchased because our Treo has a 2.5mm stereo jack and at the time I only owned 3.5mm headphones. Although I have since upgraded to a dedicated set of 2.5mm headphones to listen to music and watch movies I still use the adapter today with, for example, my Bose Quiet Comfort II noise cancelling headset when travelling. If you own a Treo chances are that like me you’re traveling around quite a bit. Therefore, the bulky and heavy charger and hotsync cable that comes in the box will not be the best to carry on the go. Instead, I highly recommend using a light and small USB Retractable Sync & Charge Cable ($15.95) that works extremely well and which I always have with me. If you never lose the stylus that comes with your Treo you can consider yourself to be extremely lucky. However, if you just know that this is one of those things that will just have a bad habit of going missing in your hands than you’ll want to get a spare set of three Pen Stylus ($12.95) – which also has the benefit of including a built-in pen for those maddening moments where you just can’t find something to write with anywhere else. Depending on your use and budget the question of how much additional external memory via an SD card you should get will vary greatly – I am evidently not the norm as I currently carry 13GB worth of SD cards with me at all times. However, generally speaking, there are three main scenarios for which there are different needs. The first is for low usage such as a few pictures and work documents and here a single 512MB ($44.95) or lower SD card will be sufficient. The second is for medium users who will have one or more 1GB SD cards ($84.95) which will typically be used to store a combination of music, movies and files. The third and last scenario (in which I undoubtedly fall) is typically for people who are using their Treo as their main MP3 player, portable movie player and file backup system with multiple 1GB SD cards ($84.95) or 2GB cards ($179). Unless you happen to have a built-in SD card reader on your PC your SD cards will be fairly useless without also having a USB SD Card Reader ($19.95) to easily and quickly copy and transfer files from your PC to your Treo. SD card readers come in all shapes and sizes but again because I always need one on the go I settled for this one which is among the smallest and lightest around. Not everyone may want to do this but many Treonauts are increasingly finding that their Treo is an excellent MP3 player thanks to applications such as Pocket Tunes Deluxe and they are foregoing the purchase of another standalone player preferring instead to carry only one device. If like me you fall in this category then you’ll want to own a Retractable 2in1 Headset ($34.95) which allows you to listen to music and make calls via the same unit. Additionally, thanks to an application called MagicButton you can now use this particular headset as a remote control with Pocket Tunes. One of the most eagerly anticipated features of our Treo 650 was its Bluetooth capability. There are now a multitude of Bluetooth Headsets ($30 to $100) that you can choose from and I recently reviewed eight of the best. If your typical call stretches over 10 or 15 minutes, that you spend over one hour on calls per day and that you are likely to make calls while driving then you’ll undoubtedly want to buy your own Bluetooth headset. In my review, I have personally concluded that Palm’s Wireless Headset ($59.95) and Sony Ericsson’s HBH-662 ($84.95) are among the top three. Alongside choosing the right Bluetooth headset, choosing the right case for your Treo can prove to be challenging among the myriad of options. This is probably the single accessory category where I have found the most divergence in opinions and personal preferences among Treonauts and my review of “A Case of Cases for All Cases” was a case in point (no pun intended). On a personal basis, the two cases that I have latched on to and which I use daily are Seidio’s Shield Holster ($27.95) and the foofpod fabric pouch ($28). Additionally, the egrips ($12.95) are excellent to prevent your Treo from slipping out of your hands or another surface. Although, as I mentioned earlier, the retractable S&C cable is my preferred method for syncing and charging while on the go I nonetheless prefer to have the convenience of a dedicated cradle both at home (by my bedside) and at the office (on my desk). For home I use Palm’s Cradle Kit ($39.95) which has the benefit of also including a built-in spare battery charger while at the office I use Seidio’s INNODock Cradle ($39.95) which has the benefit of an audio-out jack which I can connect to a set of external speakers. There are also a couple of other cheaper options. If you travel a lot and prefer to leave your laptop behind instead only using your Treo for work then you’ll need a small and light wall charger such as the Rugged Wall Charger ($14.95) or if you have already have the retractable S&C cable (or any other USB sync or charge cable) then an easy option is to simply get the S&C Wall Adapter ($9.95). Finally, if you also happen to own Palm’s Bluetooth headset then Seidio’s new Retractable S&C Duo Cable ($19.95) which allows you to power both the Treo and headset simultaneously will be ideal. 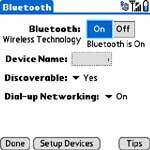 Additionally, if you plan to use your Treo smartphone’s Bluetooth Dial Up Networking (DUN) or reverse DUN and your PC does not happen to have built-in Bluetooth capabilities then like me you’ll need to purchase a USB BLuetooth Adapter ($24.95) to do so. Depending on where they live, many Treonauts are likely to spend an inordinate amount of time in their cars – more often than not making or receiving calls on their Treo – and having the right gear here will be as important as anywhere else. Firstly you’ll want to have a spare Car Charger ($12.95) for your Treo and here again if you happen to have Palm’s Bluetooth headset you’ll be able to charge it as well with this unit. Next you’ll want either a basic Vehicle Mount ($19.95) or a more sophisticated one such as Seidio’s G2500M Car Kit ($129.95) which benefits from an internal speaker for calls and music – either the mount or car kit will also prove essential if like me you decide to invest in a GPS solution for your Treo. The essentials below will not be for everyone either because of their cost or because their use is so specific that it may not be relevant to you. However, I own all of the accessories below and have found them to be extremely useful in particular circumstances. Although the battery on our Treo seems to last forever, there will nonetheless be some power users whose daily Treo routine will be so intense from either calls or data usage that carrying a Spare Battery ($34.95) will be an absolute must. For example, I always carry one when travelling as I am often unable to find the time to plug-in to recharge during the day and I find it easier and safer to carry a spare battery in my pocket or briefcase. Whether in the car, office or at home, the addition of a USB powered FM Transmitter ($49.95) is absolutely great if you want to listen to the music on your Treo via the more powerful and higher quality speaker on your stereo. The benefit is that it doesn’t require any batteries while the drawback is that it’s a little large but otherwise it works extremely well. Although I haven’t yet had a chance to review this category (but will in the next couple of weeks) I have found using a standalone Bluetooth speakerphone such as the Supertooth II ($109.95) particularly in the car but also at the office to be incredibly easier, more convenient and often providing better voice quality than using a Bluetooth headset. With a clip the unit attaches to the visor and you can easily answer and reject calls at the press of a button. Not many Treonauts use a standalone keyboard but those who do can’t live without one as they often use it with their Treo instead of a laptop as their main data entry device. Evidently typing a few lines or even paragraphs is OK with the small built-in keyboard on our Treo but for longer documents either an infrared or Bluetooth keyboard will be an absolute requirement. I tested and reviewed both options a little while back and eventually settled on Palm’s Wireless Keyboard ($69.95) because it was the cheapest and overall best one available. I’ve only recently had the opportunity to test and review various GPS solutions for our Treo but Oh Boy what an amazing discovery it has been. As I wrote in my review, I will never again travel anywhere without a GPS unit and I am absolutely over the moon with the TomTom Navigator Bundle ($299.95) that I ended up selecting and I’ve been using it almost on a daily basis since then. Alternatively, I am told that the TomTom Navigator 5 + GPS Bluetooth ($279.95) is actually even better because the unit’s chipset is SiRF star III instead of star II which I currently have. At any rate, anyone who has a car and can afford it should add one of these GPS solutions to their Treo – it really is quite amazing to experience how well it works. I have been evaluating enfora’s WiFi Adapter ($149.95) (the only WiFi solution available for our Treo) for a couple of weeks now but have not yet had a chance to write a full review. What I can tell you is that my experience has been extremely good, that the unit is significantly smaller and lighter than I had thought and that I have been impressed by how easy it proved to setup and use – a piece of cake. Among others, it is the ideal solution if you’d like to leave your laptop behind when attending a conference for example but want to access your email and surf the web while you’re there. The only drawback is that instead of using the Treo charger, enfora’s WiFi requires its own separate and somewhat bulky one which I thought was rather dumb. Evidently not everyone will need or be able to afford all of these accessories (my own bill would come in at some $3,000 or so…) but it is however worthwhile noting that – in sharp contrast to days past – you will be able to reuse many of these accessories with future Treo smartphones so most of your investment will be considered ‘safe’. Additionally, they will also have a good resale value should you wish to upgrade at a later time. 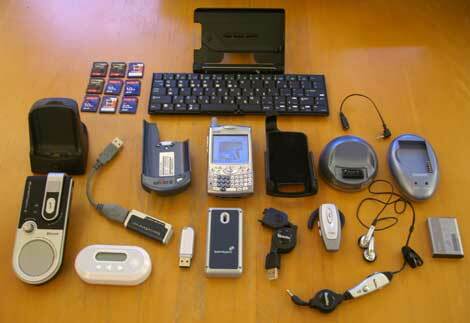 Many people will focus on buying software as their main means to enhance their Treo by making it more fun and useful. However, as I hope you will be able to appreciate from this list, I feel quite strongly that these accessories are more than just some “nice to have gear” but instead form an integral part of delivering a superior Treo experience. Finally, I will also be adding this post to the Discover Treo section so that you can easily point family, friends and colleagues to it when they ask you what accessories they should get for their Treo.